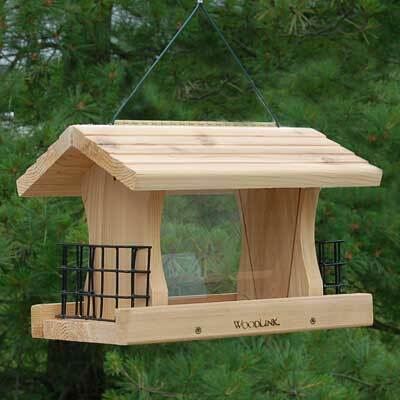 Place a charming, rustic bird feeder in your yard with this Woodlink Deluxe Cedar Bird Feeder with Suet Cages. This natural looking piece creates a truly versatile feeding area in your backyard, offering birds both seed and suet. The cedar frame forms a lasting unit, and its shape lends classic design to your garden. The pitched, lapped roof covers the reservoir, protecting the 2 quarts of seed from the elements. Two clear, plastic panels complete the seed chamber, angling inward to direct feed toward the bottom platform. These panels keep the seed level easily visible, and one even removes for thorough cleaning. A suet cage on two sides of the reservoir holds one standard suet or seed cake each, inviting even more birds to dine. Wide pieces of cedar line two sides of the bottom platform, creating perching room and a lip to keep seed on the base. The roof hinges upward for refilling this item, and an attached cable makes hanging the feeder simple. Its cedar construction deters rot, for a durable and lasting addition to your backyard. Enjoy a variety of birds dining in your garden from this Deluxe Cedar Bird Feeder with Suet Cages. Made in the USA.